There are A LOT of trucking schools across America and most of them operate the same way: students are required to begin training at 6 a.m. on a Monday, and they’re asked to stay until a speciﬁed time. Nice prison. CDL College takes a diﬀerent approach, one that accommodates your lifestyle and schedule. Read on. We’re unlike other schools. When we ask, “when can you begin training?”, we mean it. Tuesday? Saturday after cartoons? Open Enrollment means students begin training when their schedule allows. If you can’t quit your day job, don’t. How often you train is up to you. We don’t tell our students when to come to school, they tell us when they can come to school. Flexibility. Check this: we had a student who began training, went to jail and pounded rocks for a year, then returned to ﬁnish training. Our classes start every day. Pick your training hours, we’ll accommodate you. Read how CDL College came to be. 98%? Yep. Our training techniques are advanced: computers everywhere; a phone app that tracks student time; a semi tractor covered in ﬂat screen TVs with narrated lessons; and the computers...did we mention those? We use high-tech solutions to train our students. We also hire the best instructors in the trucking industry. You can start training with one lesson. CDL Courses and Fees page for full descriptions. CDL College is 100% unaﬃliated. We DO NOT recruit for any trucking companies. We do, however, run an online job board to assist our students with ﬁnding gainful employment. It’s called Gary’s Job Board. Experienced drivers can also visit the site should they ﬁnd themselves in need of a better driving job. Just create your FREE account, it takes 2 minutes. Search the jobs on the website, or wait for carriers to invite you to apply to their jobs based on your qualiﬁcations. Check out garysjobboard.com. 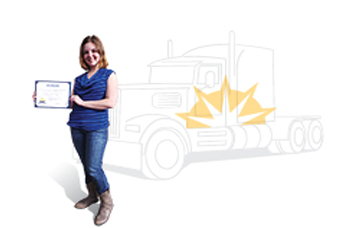 After your top-notch CDL College training is complete, we’ll test you for your license. We are the largest 3rd party tester in Colorado. No other entity in the state tests more vehicles than CDL College. That’s just gutsy. CDL Testing page for full description. Written CDL Testing page for full description. Read more about Why CDL College? When I first came to CDL College, I couldn’t drive a manual transmission car let alone a semi truck. Through the personalized training of CDL College instructors I was able to not only learn how to pass my CDL test but also learn how to control a semi truck in all kinds of conditions including: night driving, mountain and snow. Looking for CDL Classes in Colorado? CDL College does not recruit for any trucking companies. Never has, never will.